Heaney revealed his sudden ‘feeding-frenzy’ to DOD (p,325) : Shortly after I came home (from a trip to Rome in 1989), I was pouncing for twelve lines on all kinds of occasions, chance sentences from my reading, chance sightings of dictionary entries, chance visits to places that unlocked the word hoard. I wanted, if possible, something nonchalant yet definite. 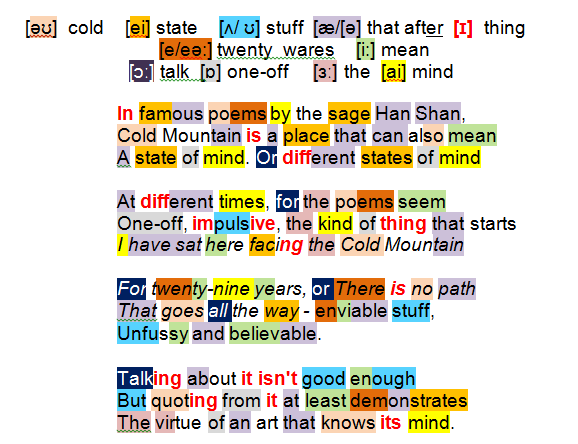 ‘Unfussy and believable’, as I say in the section about Han-Shan’s Cold Mountain poems . Heaney offers his reader a clue as to how to ‘enter’ the poems: You could think of every poem in ‘Squarings’ as the peg at the end of a tent-rope reaching up into the airy structure, but still with purchase on something earth­ier and more obscure (DOD 320). Shan’s Chinese poems from the first millennium (the sage Han Shan) reveal the subtleties of the Chinese language: a poet who shares his name a location (Cold Mountain is a place); poetry written in a language whose hieroglyphic patterns can be used to place different meanings on words or even a state of mind or, indeed, vary their meaning according to circumstances (different states of mind/ At different times). Heaney has spotted a similarity between the Chinese verse he is reading and his current approach to his own work (One-off, impulsive). The lines Heaney quotes provide insights into Han-Shan’s ingenious conjunction of time, place and self: he has spent a lifetime (twenty- nine years) studying a place that bears his name, in other words ‘himself’; he has discovered there is no easy way of getting to the ‘subtle principle of things’, not least the self (There is no path/ That goes all the way); Han Shan has created a poetry Heaney approves of (enviable stuff) not dissimilar to Patrick Heaney’s line (see Crossings xxxiii) in house design: unfussy and believable. Han-Shan deserves more than a passing mention. Heaney quotes him in tribute to the merit of a purposeful, unwavering art that knows its mind. … ‘nonchalant yet definite’.